This article is guest blogged by Eric Broadbent, a certified USA Track and Field Level 2 Coach, Certified Strength & Conditioning Specialist (CSCS), holds USTFCCCA Track & Field Technical Certification, and a USA Weightlifting Sport Performance Coach. He wrote a good 4 part series on Multi-Event training, as here is my Freelap Friday Five Interview with him. To read all his guest articles on this Blog, click here for the full list. 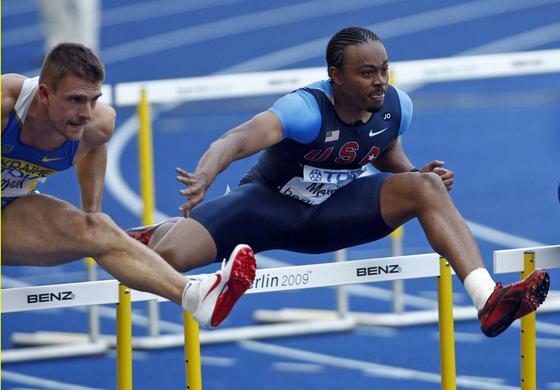 An old friend and coach of mine, Jason Kilgore, and I were having a lengthy discussion about coaching the lead leg in the hurdles and it got me thinking about other events and some misconceptions that exist within the sport of Track and Field. I have had the luxury of being around some very good coaches when I was still an athlete and I learned a ton from Jason and my other coach, Mike Young. Having said that, I wanted to shed some light on various misconceptions that exist within the track community and hopefully share some of what I’ve learned from these misconceptions. I hear coaches and athletes all the time talking about what they should be doing once they have already left the ground and how it will improve their performance in different events. Now don’t get me wrong, I do think there are important things to talk about and work on in training with regards to the position of the body and limbs once you have left the ground. I believe however, that there needs to be a small amount of time spent working on this and the majority of the time should be spent coaching and training what the athlete does on the ground. If everything is perfect leading up to the takeoff then you can start working on flight mechanics etc. Often times though, if you see something wrong with the flight, you can trace this back to something that happened earlier on, and most likely, on the ground. Everyone is entitled to their own opinion here and I am not expecting everyone to agree with what I say. Here are a few things I’ve heard and disagree with when it comes to coaching the athlete with flight cues. While this cue may actually hold some weight in certain instances, most times if the athlete appears to be floating the hurdle, aka spending way too time in the air while their competitors pass them, the root of the problem stems back to a poor takeoff. In previous posts I talked about parabolic curves and how once an object has left the ground, there is no way to alter the flight path. Knowing this key point, we can deduct that the athlete needs to have a lower flight path. This could also be the case of the athlete taking off too close to the hurdle, but again the coach needs to get to the root of the problem. So assuming the athlete is taking off from the proper distance from the hurdle, the athlete should attempt to push through the hurdle longer to decrease that takeoff angle. This will in turn get them on the ground faster. Having said that, if the athlete attempts to solve the problem of a higher take by snapping their lead leg down, this will most likely lead to over rotating and poor posture as the athlete attempts to correct both as they move in to the next hurdle. Now assuming the takeoff angle and distance are both correct it may be a good idea to cue the athlete to bring the trail leg through faster which will in turn cause the lead leg to snap down faster. When I hear coaches say this to an athlete, I like to revert back to the approach and see if the athlete has done everything correctly leading up to and during the takeoff. If they are in fact doing this correctly then it may be complete appropriate to cue an athlete to keep swinging as they might be bailing out early. However, most of the time if I see a poor swing to vertical, there will usually be poor posture and in turn a poor takeoff/swing leg. Think about it like this. If an athlete takes off with upright posture and takeoff underneath them, then they have to essentially swing 180 degrees to get to vertical. Now imagine that athlete leaning forward a few degrees and the takeoff being behind them. The athlete now has to swing more than 180 degrees to get inverted and most of the time this isn’t going to happen unless they are very experienced, and even so it will take away from their full jumping potential. If posture is not the problem then it could be the case of the athlete not leaving their takeoff leg behind and feeling a stretch across their hip. If an athlete rushes the swing at takeoff it throws off the timing of the jump and negates any stretch reflex they may have gotten from letting that takeoff stretch behind them for a split second prior to swing out and up. It will take a lot more effort to get the body inverted at this point and will most likely cause them to bail early. This is another one that makes me laugh and one you will also see happen in the long jump as well. 9 times out of 10 if the athlete has done something wrong in the triple jump, you need not address that specific issue, but look back at the previous phase or portion and look to that area for the problem. Keep in mind too that problems compound, and something wrong with the third phase could be traced back to a poor transition phase in the approach! When you watch video of an athlete trying to get that full extension in their third phase and their legs just seem to collapse like they are doing a seated leg curl I want you to rewind the tape and go back to the start. Look at the approach and each phase and make sure everything measures up. Most of the time the issue will be because of poor posture, hip alignment, foot contacts, and takeoff angles. Some of these issues may be because the athlete is very weak or inflexible as well. The problem has nothing to do with the athletes ability to keep their legs up. Try standing up and bending down at a 45 degree angle. From there, try and lift your knee to your chest then extend your leg straight out and parallel with the ground and you will see how hard it becomes. Then try and do the same thing but with upright posture…a little easier right? No one is perfect and we are all trying to be the best coaches we can be. We want to say as little as possible to our athletes while still conveying our message to them and getting them to perform better. Getting to the root of the problem is every coaches goal so I encourage you to try and get to the core of every issue you see with your athletes and fix the ones that are most important in helping them achieve peak performance. When an athlete’s technique breaks down, work backwards and find what started the problem and work on correcting that first and foremost. Eric Broadbent is a certified USA Track and Field Level 2 Coach, Certified Strength & Conditioning Specialist (CSCS), holds USTFCCCA Track & Field Technical Certification, and a USA Weightlifting Sport Performance Coach. He also has over 6 years of coaching experience including coaching at North Carolina State and West Chester University. As an athlete, he won the USATF 2012 Indoor Heptathlon and was an Olympic Trials Qualifier. That same year he represented the US in the Pan American Cup and took 2nd place. As a national level competitor he also had top 6 finishes at the 2009 and 2010 Indoor Combined Events Championship and finished 10th at the 2011 Outdoor National Championships. 100 percent I agree. It is all in the setup. Regardless of the event, the better the set up is coached the less teaching that has to be done. Question is how many know how to set the event up? Even for hurdles the footwork between the hurdles sets up for what will happen in the air. In regards to the two hurdle examples Eric cited – “floating” and “snapping the lead leg down” – I agree. The center of mass is in predetermined,unalterable parabolic flight once the hurdler leaves the ground. As in the high jump and other flights, the athlete can effect rotations (which started on the ground) – by extending or shortening levers, or in the case of “snapping the lead leg down” (a cue I dislike) by bringing the trail leg from behind the body to the front.